What could be a better gift for Mother’s Day than a bouquet of pom pom posies that you can enjoy all year long? You won’t believe how easy it is to make pom pom flowers for a special mom in your life. Walmart challenged us to come up with a fun Mother’s Day project that anyone can do for someone special in their life and we are so excited to show you how easy (and thrifty!) this little project is! 1. Make an assortment of Pom-Poms using your desired method of pom-pom creating. Follow my picture tutorial above if you would like to use the Clover Pom-Pom Maker that I discovered. Why I Am Using The Clover Pom-Pom Makers: I have tried every thrifty known method for making pom-poms from cardboard, to forks, to compact discs. To make this bouquet of posies, I decided to see if I could find a gadget to help me and I cannot rave about this Clover Pom-Pom Maker enough. It is the perfect tool to add to your arsenal if you are making pom poms and it is simple enough that my 7 year-old could use it. 2. Open a package of cookie sticks and remove one from the package. Begin wrapping yarn around the cookie stick, covering all of the white parts. I start the yarn weaving the tail in at the top so that I don’t have to glue it at the top. It’s okay if there is a bit of white showing at the top because your pom-pom will cover it! 3. Once you are almost to the bottom of the stem, add a dab of hot glue and continue wrapping until you get to the bottom. Snip the end of the yarn that has been secured with the glue. 4. Add a dab of hot glue at the top of your stem and then secure a colored pom pom to the top. Hold in place for thirty seconds. 5. Gently bend your stem (gently or it will break) to create a more natural looking flower. Set aside and repeat this process with the rest of the flowers. 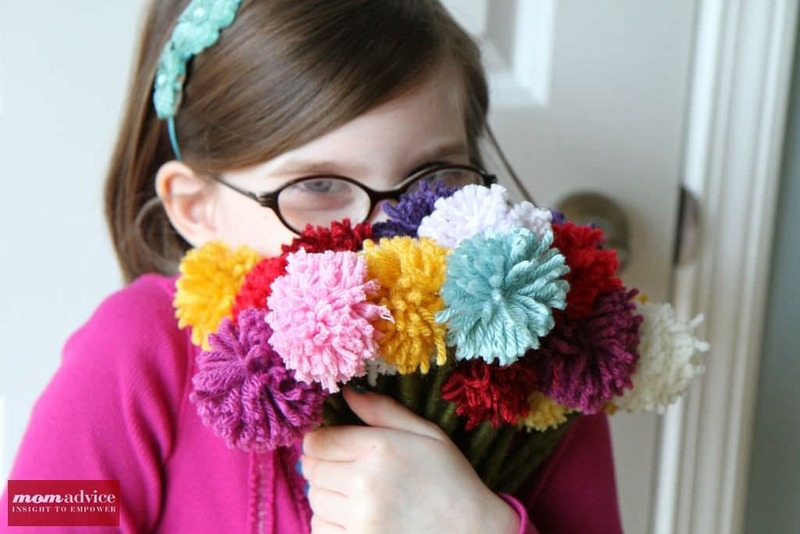 Easy yarn pom-pom posies that are sure to brighten any mom’s day! If you want to really make this cute gift stand out even more, here are a couple of more sweet ideas to really set the mood for a special mom in your life. I went ahead and bought the Small Clover Pom-Pom Maker to show you how cute this one is for decorating a cupcake for a special mom in your life. We just hot glued this little cutie on the top of a toothpick and it only took a couple of minutes to add a little pom-pom magic to a store-bought cupcake! Who could resist a gift as sweet as this? Not only is it the perfect Mother’s Day gift, but it would make a sweet gift to celebrate any occasion. Pair these pom-pom posies with a gift certificate to pick up craft supplies for the crafty mom in your life. I also joined Vine this weekend which is a fun app for making a quick 8 second video. Here is my 8 second video of my pom-pom making. 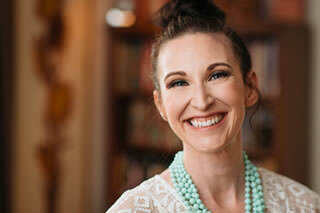 I would like to disclose that I am in my favorite polka-dotted pajama pants here for this super professional tutorial!